Maize flour dosa is another instant breakfast variety. Anything healthy is my first choice. Maize or corn is a very healthy grain, it has lots of dietary fibers, rich sources of Vitamin B and A are also found in it. It does not have cholesterol. The contents in it helps in improving of kidney function and bone health. 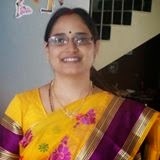 And also helps in lowering LDL cholesterol through which cardiac diseases can be controlled. 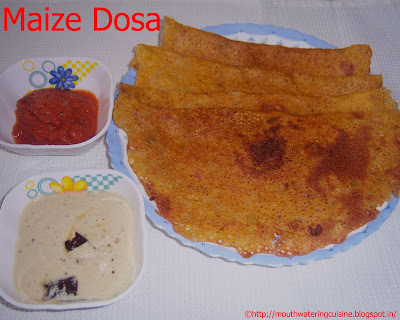 Making of this dosa is very easy and simple. Serve it with simple onion chutney or with any other pickle. I serve it with coconut chutney and onion chutney. Heat oil in a kadai add mustard seeds and cumin seeds. Allow them to splutter then add onions and green chillies to it. Saute them for a while or till the onions become translucent. Keep it aside. Mix maize flour and rice flour. I took 2:1 ratio of the flours, but we can add a little more rice flour to have more crispier dosas. Add salt, red chilli powder and mix well. Add water to it and make dosa batter as thin as that of Rawa Dosa. Add to it the above sauteed chilli and onion mix. Mix well. Heat dosa tawa, pour a tumbler full of batter on it. Add oil to it. Cook for 2 minutes, flip it and again cook for two minutes. Cook on high flame only. Remove from the heat and serve. Serve maize flour dosa with coconut chutney and onion chutney.